Silverton Mountain is pretty close to the most pure skiing experience one can find today, an epic mountain, bountiful snowfall (the deep and light Colorado kind! ), and none of the distractions of other ski areas (crowds!). Get ready for a unique lift-served ski adventure! 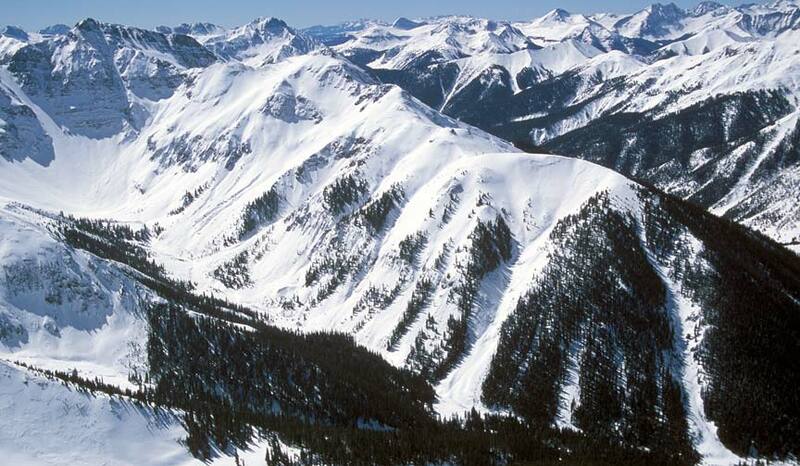 Silverton Mountain skiing is similar to a cross of heli-skiing experience, snow cat skiing, and resort skiing but really unlike anything else in the country. You will be accessing up to 1,819 acres of backcountry type terrain via chairlift and without the big crowds signature to other ski areas. There are no groomed runs, no cut trails, just loads of nature’s finest black diamond skiing in the U.S.A. If you plan to go with a guide be sure to check out the Guided Skiing Page. If you prefer to go on your own during the unguided season, don’t miss the Unguided Skiing Page. Put your boots on at the car. Leave your skis near the lift. Get your lift ticket and rental gear at the tent and bus. Come back down towards the lift and join a group. Stick together with your friends/ski partners. Hike and ski all day. Take lunch or breaks at the base as needed. Slug a few beers at the tent and get back to town for a meal and cocktails. Check out this blog post for a little more “exact” schedule. Please bring layers…. for everything from warm and sunny to cold and snowy mountain weather. Equipment made with waterproof material is encouraged. Your backpack should have ski/snowboard carrying capabilities. We also rent BCA Float avalanche airbag backpacks, K2 skis, K2 poles, Smith goggles, Smith helmets, BCA Tracker beacons, K2 shovels, K2 carbon probes, Dakine Backpacks, and Venture Snowboards. We do not rent boots or snowboard bindings. There is no running water at the ski area, but there is bottled water for sale. Do I need to bring my own avalanche equipment or can I rent from you? Yes! You need to have a beacon, shovel, and probe to ski or snowboard. We have these items for rent as a package including a BCA Tracker beacon which is very easy to use. Each item can be rented separately. We have BCA Float Avalanche Airbag Backpacks & Dakine packs for rent (which the guides use) if you need a pack that carries your skis/snowboard. What kind of ski rentals do you have? The best skis on earth… K2 super fat skis are available for rent. All of the best K2 powder skis are stocked. You can reserve them online and pick out a specific model when you arrive at the mountain. The size and fittings will be taken care of by our rental professionals when you check in. Please arrive at 8:15 for guided skiing if you need to rent skis. What kind of snowboard rentals do you have? Venture Snowboards: super tough boards crafted locally from sustainable materials. Please bring your own boots, bindings, and hardware if you are planning to rent a Venture Snowboard. Do I need avalanche training to ski/snowboard there? No. The guides will conduct a small safety briefing in order to familiarize those without avalanche experience. Do I need skins or snowshoes for the uphill travel? No skins or snowshoes are needed except for custom heli packages. All of Silverton Mountain’s terrain is accessible by boot pack.